Within our range we supply both Socketed Cricket Cages and Freestanding/Mobile Cricket Cages available in either Steel or Aluminium finish. We also offer a Winch Cricket System for use with your artificial wickets. To accompany the range we supply various optional heights and high quality cricket netting along with practice stumps and other accessories. Our supplier Harrod UK continue to work with consultants from the England and Wales Cricket Board to raise standards for cricket bays and netting. Collier Sports can provide any Cricket Equipment you may need, so contact us today to get the best prices for your next order. 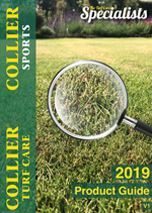 Call 01328 700 600 or email sales@colliersports.co.uk and speak to our specialist team today!